Woodward is the first small town I have lived in and has a population of around 15,000. I'm not sure if all small towns have the same culture but I can attest that Woodward has a completely, new to me, culture. Some of it is funny, some is great, some is odd and today I want to share it with you. queso - If you go to a Mexican restaurant in Woodward you will not only get salsa but queso, which is gloooorious. I guess small town restaurants are all in competition with each other. There are about 5 - 6 mexican restaurants in town and apparently one restaurant started serving queso so they all had to follow. Bless that restaurant who started with the queso. coffee service - Woodward has a couple of places that serve good coffee. Recently, I went to a local cafe that also has a coffee bar. First off, upon entering I just got stared at for a while, which was awkward. Finally the owner realized I was just there for coffee and had the barista / server prepare it. I told them I wanted a to-go coffee. Well, they made my coffee and handed it over .... with no lid. They then proceeded to tell me that they had no lids because the company sent them the wrong one and asked me if that was ok? I don't know how a 'to-go' coffee with no-lid is ok. I mean sure, let me just get in my car and burn myself. It's little things like this that although they seem annoying you just get used to it and smile. peeping neighbors - This one is my favorite! There is a lady in our apartment complex in her 70's. She also goes to the senior center where I volunteer once a week. Well, this past winter I told Dave that we need to shut our blinds early because people would see us and that would just be bad, real bad. My day to go to the senior center came and that 70 year old lady hurried me over to her table. She said the following: "The other day, I walked my dog later than normal and I looked up into your apartment and I saw your husband standing there with no shirt on and wooo-weeeee. There was a white window, a white man and I thought 'what the he**, why not?'. I just wished the window would have gone lower than it did, but don't worry honey, I wouldn't of gotten too excited it's been 20 years". HOLY GUACAMOLE! I died laughing. I just couldn't believe some 70 year old lady was gawking and lusting after my husband. kindness - You know what? Even though Woodward has some things I'm not used to I have to say that the people here are beyond friendly, kind and welcoming. I went to a local boutique when I first moved here and the lady gave me a candle just because I was new. I also bought a punch card at a coffee shop and the nice barista gave me a coffee on the house because I was new. People are kind here, they are friendly, they are simple. I know I have readers who live in different countries, different states and completely different types of cities. I want to know - what is something unique about the culture where you live? 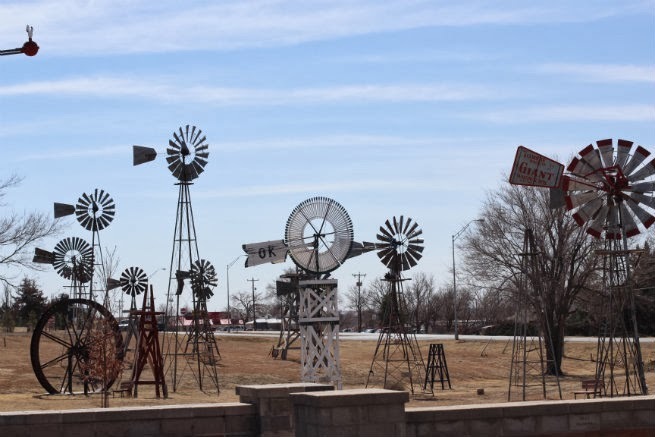 Just in case you wondering why I have windmill pictures ... there is a windmill museum about 20 minutes from us. Hahahahaha about the old lady! Whenever I think of small towns, I think of places like Stars Hollow on Gilmore Girls... ANYWAY! Yes, you captured some of the quirks of small town living really well! It's an experience! I probably eat the equivalent to a meal in chips, salsa and queso. It's delicious but dangerous. How fun that you are in a small town in France. how long have you been there? The old lady is funny!!! I always am quick to shut my blinds now. Small town living is for sure an experience. I'm glad I got to live here but I don't see us living in a small town long term. 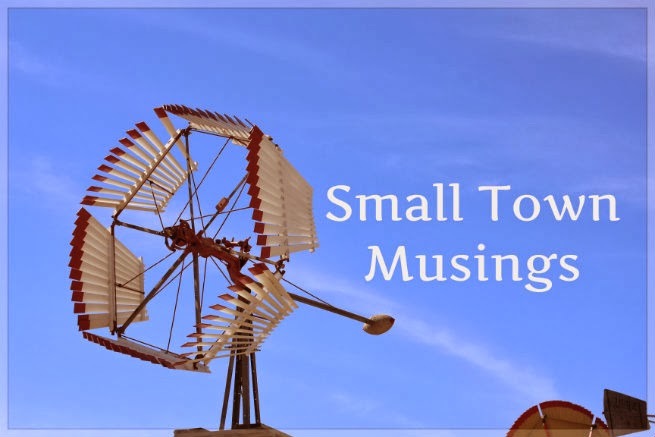 Do you live in a small town? The 24 hour food accessibility sounds really nice! It's weird because even when I go back to Wichita I feel a bit claustrophobic and overwhelmed by the traffic. ha! I guess I will just have to get used to it again someday. Something unique to Iceland is people don't really do small talk or smiles to strangers. I guess it is such a small country they like to keep a bit private and want to be left alone. That is so odd to me that they don't smile to strangers. What happens if you just smile at them anyway? Do they think it is weird? I love small town life! I grew up in the suburbs and always wanted to move out to the country and I'm so glad I did! It's definitely a different way of life! I grew up in small town Wisconsin - so believe me, I identify with you!!! Right now I'm in Boston and it was quite the adjustment when I originally moved. Whew! Oh my gosh that crazy lady looking at Dave! That's hilarious and also kind of weird. Ha! I will say, the queso thing isn't just small towns... that's just Oklahoma! They do not do that in Illinois, but every Mexican restaurant here has queso and salsa. Crazy! And Jordan is one of those beef people... he says it's not a real meal unless it has meat in it! haha. I hate to tell you this, but I don't consider Woodward a small town. My hometown has 2,000 people in it - there isn't even a coffee shop to serve you to-go coffee with no lids! But, I love that every Mexican restaurant serves queso to every customer. That's reason enough to go visit! It is a different way of life but there are a lot of pros to it. Good job in moving to the country like you wanted to! I bet that was a big culture shock. I wonder if you would have reverse culture shock going back to a small town life? If I didn't know that little old lady I would have been completely freaked out. However, I visit with her a lot so although it was weird, it wasn't too creepy. I had no idea that OK served queso all over! One more reason I like this state now. ha ha ha that Jordan is a beefetarian! There is a guy at our Bible study and he literally won't eat a meal unless his wife cooks with beef. Different culture, I tell ya! Compared to 2,000 Woodward is a HUGE town! You are so right. I seriously can't imagine living in a town of 2,000 but then again I never imagined myself living here. The town I grew up in has around 350,000+ so I guess that is why it is a small town to me.